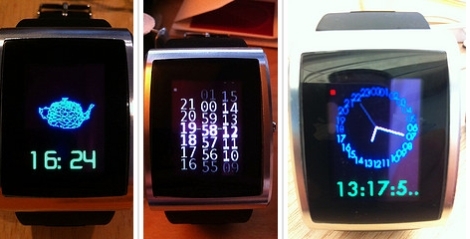 If there is one thing hackers return to time and time again, it is clock/watch hacking. There are always creative ways to tell time, and with several “hackable” wristwatches on the market, there is bound to be no shortage of neat timepiece hacks. [hudson] from NYC Resistor has decided to take on a fun challenge for the next month revolving around his programmable inPulse watch. Over the upcoming 30 27 days, he will design, program, and publish a watch face for the timepiece. He already has 3 days behind him, and the results are pretty interesting. The concepts are creative and functional, though due to time constraints they sometimes end up a little less polished than he would like. All of the code is available on his Bitbucket page if you have an inPulse watch and would like to play along or improve on his work. We think it’s a pretty cool project, and we are eager to see what he produces each day. Stick around to see a quick video showing off one of his 3D watch faces. [Eric] just told us about the watch he developed that displays info from a BlackBerry via Bluetooth. The watch displays updates, message alerts, incoming call information, and… tells time. Setup and control is handled with the BlackBerry keypad. The device is charged with a micro-USB connection and will last for about four days without a recharge. We’d chalk up the rather long battery life to the use of an OLED display, which will use less energy when a portion of the display is left black. So why is it here? Well, he’s got a couple of blog posts that detail two of the final prototypes that you might find interesting. What else? Oh yeah, his original prototype used an Arduino with a Nokia 3310 LCD display. For those of you who continually call the Arduino a worthless toy, looks like it’s good enough to use when taking a product to market.